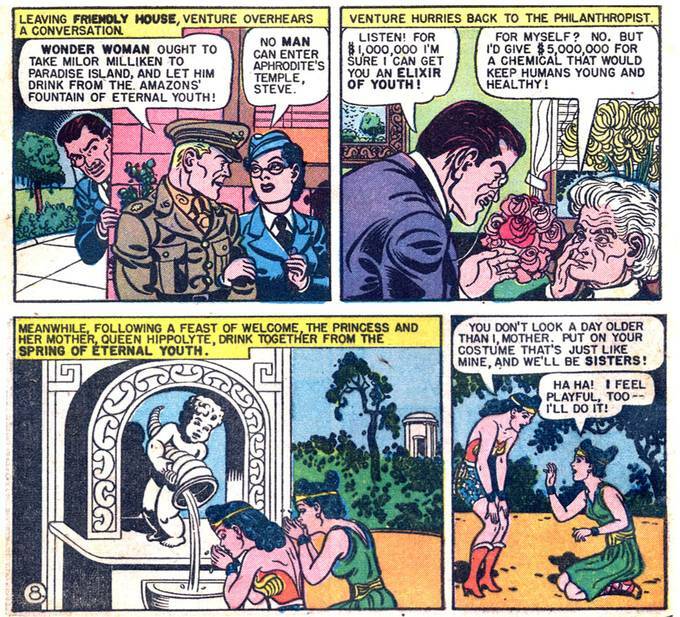 WW 113: The first Silver Age appearance of Wonder Tot, though it's Diana as a kid. We see how every year disaster befalls Diana's birthday cake. 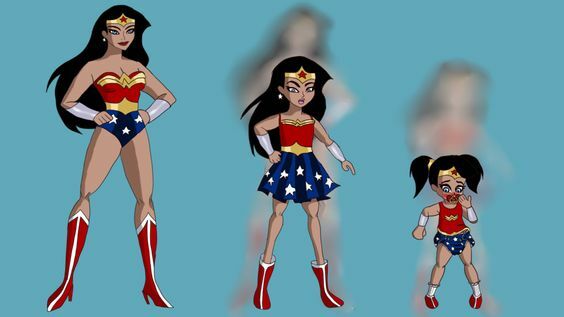 Several of the adventures of the classic Wonder Woman had her regressing to childhood or infancy. In issue #132 [according to "Ambush Bug Miniseries #3], WW gets shot with a regression ray which turns her to Wonder Teen, then Wonder Girl, then Wonder Tot, and finally Wonder Infant. As an infant, she can understand the babbling of an infant boy who was the only witness to a spaceship landing. A trip to a parallel dimension shaves years off Wonder Woman and Col. Trevor (AR, RN). Perfection reveals that her capture of Mr. Jupiter was only a cover for her true goal--capturing Wonder Girl and getting her to reveal the Amazons� secret of eternal youth. TV Series: Season 03; Episode #22: "The Man Who Could Not Die"
A man can't die no matters what happens to him. Perhaps even old age will have no effect on him. Which has the Wonder Woman in Grow Down Land issue in it. (AR) Doctor Poison (Princess Maru) Succumbed to her own poisons; reverse-aged herself to nothing. Well Issue 151 was a bust - just a reference to the character going bye-bye and no issue sidenote -- John L.
Wonder Woman (AR) Queen Clea of Atlantis. Presumed deceased; reverse-aged.